I come across stories of many parents who don’t have support when it comes to raising their children in more than one language. This is especially true when only one parent speaks the target language which they want their children to learn. Sometimes the spouse is not on board, or the grandparents aren´t supportive. At times it can feel like you are playing defense against family members who just don´t agree with how you´re raising your children! I’m not going to lie, I have amazing support and my husband WANTS my daughters to speak more than one language. He’s not only appreciative, but he’s enthusiastic about it! However, being that I am the only fluent Spanish speaker, and that my husband and inlaws don't speak Spanish fluently (if at all), I do have some insight on the hurdles that a Family can face when teaching their children a second language. Therefore, I'm going to share with you 5 tips for including non-target language speakers in your language-learning journey. Sometimes, people don´t understand how beneficial learning a second (or even third and fourth) language is. The old-fashioned notion that children will become confused and not learn any language well is still believed by some. Even those who support bilingualism are often worried that their children´s speech will be delayed by learning more than one language. As advocates for bilingualism, it falls upon us to educate them! There are many articles and research reports that highlight the many cognitive, social, and professional benefits of bilingualism. Let your family in on this knowledge and they will become your allies in the language-learning journey you have chosen. Include others in the process. Teach them some of the language or better yet, have your child(ren) teach them! Some family members may want to study the language intensely, while others will be satisfied with learning just a couple of words. My husband, who as I said before is very enthusiastic about Spanish, knows and understands a lot (more than he lets on actually). But he often asks me how to say certain things so he can teach our girls something new. For a period of time we even had vocabulary words posted all over the house so that he could practice! It was really cute and a great topic of conversation when people would come to visit. them about the people, places, foods, music and customs of the places that use the target language. If you want your children to become not only bilingual, but also bicultural, it´s important to participate in these types of celebrations. Whether you are making a cultural meal, hosting a celebration, or attending one, including family members is a key way to making them more understanding and supportive of your goals and of who you are as a family. This is often a point of contention. Some people think it´s rude to speak another language in front of people who do not understand and others are not willing to compromise on their language goals in order to accommodate others. Now, it is very important that your child(ren) often hear and participate in the target language, or they will never fully learn! However, it´s just as important to remember that the goal of language is to have people connect. It´s not fair to family members and friends to feel like they cannot connect with your child. That being said, there are ways to make sure people feel like they are a part of the conversation when you are around. You can speak to children in the target language and then translate for others around or even have your child translate for them. Remember to be aware of your setting. It is one thing to have a one on one conversation with your child in the target language, even if others are around, and it´s a completely different thing to dominate the dinner table with a conversation that others do not understand. Be aware of people´s feelings and as long as you have plenty of time together in your target language, translating for others and encouraging your child to communicate with others will not hurt one bit! In fact, it will help others feel like they are a part of your journey. Often, one of the biggest determinants of whether family members will support your language choices is whether they feel like they are being left out or not. Parents and grandparents want to be important to children and if they feel like their contributions are being undervalued they will resist you. A father who feels like he can´t communicate with a child or a grandmother who feels like she is unappreciated and unwanted, will often lash out against the idea of a child being bilingual. It´s important to emphasize that their language, culture and traditions are just as important. Encourage communication and have them spend time together. Balance your child´s experiences and they will become well-rounded and be able to navigate in both of your worlds. I hope this piece was of encouragement to you. It´s important to have allies when you are raising your children to be bilingual. It´s hard work enough without having to constantly argue and defend your choices. Including family members, even if they do not speak the target language, will offer you much needed support and encouragement. We want to hear from you! Have you come across resistance to your language goals for your children? How did you handle it? Let us know in the comments below. 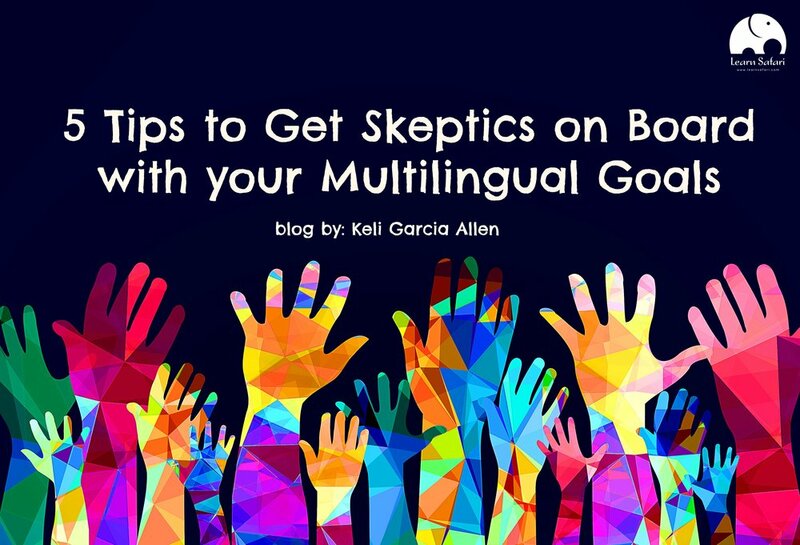 About the AuthorKeli Garcia Allen is a certified Spanish teacher and currently works as a Preschool teacher in a bilingual classroom. She is the Head of Content for Learn Safari and is currently working on Spanish Safari, Spanish Learning game for children 4-10 years old. You can follow her and the rest of the team on Facebook, Instagram, and Twitter.